Anyone who has ever changed a lightbulb or sat beneath the fluorescent lights of a DMV office is likely familiar with the difference between fluorescent and incandescent light. In recent years, there have been numerous discussions about incandescent vs. fluorescent light, mainly related to the power required to run incandescent bulbs in the midst of an energy crisis. Both light spectra have pros and cons, and depending on your needs, one style of lighting may fit better than another. What Are Incandescent Light Bulbs? Incandescent light bulbs are what is known commonly as traditional light bulbs. These are the bulbs that most people who were born prior to 1990 are familiar with. They're also the kinds of light bulbs that are most common in a home or other private space. They give off a warm, whitish light and have a clear or opaque glass shell. Incandescent light bulbs work when electricity is applied to the bulb. The electricity heats a filament in the bulb, causing the filament to emit light. The filament then projects its light outward through the glass shell in which it's enclosed. If the filament breaks, as anyone who has ever dropped a lightbulb knows, the lightbulb won't work. Incandescent light bulbs are the oldest variety of lightbulb still in production. They have evolved since the early days of the Edison bulb, but the method of generating electricity is the same. Incandescent light bulbs are popular because of their warm light, but they're not particularly energy efficient. Fluorescent lights are a variety of light bulb that's much newer than incandescent bulbs. Fluorescent light bulbs became popular over the last 40 years when concerns about the energy crisis began to redirect public attention toward the amount of energy used in our light bulbs. Fluorescent lights emit light when an electronic charge is passed through an ionized gas. This charged gas then reacts with the phosphorous that coats the inside of the fluorescent bulb, producing light. Fluorescent light has a very different light quality from incandescent light. To many people, fluorescent light seems "colder." Fluorescent light bulbs also take longer to become fully illuminated than incandescent bulbs do. However, once they're illuminated, fluorescent bulbs last much longer than incandescent bulbs. Additionally, it takes far less power to illuminate a fluorescent bulb. While the quality of the light has been criticized from an aesthetic point of view, there's an argument that the light emitted from a fluorescent bulb is easier on the eyes and therefore preferable to incandescent light. Fluorescent light can also illuminate more space with less energy. Fluorescent and incandescent bulbs are both lit differently. 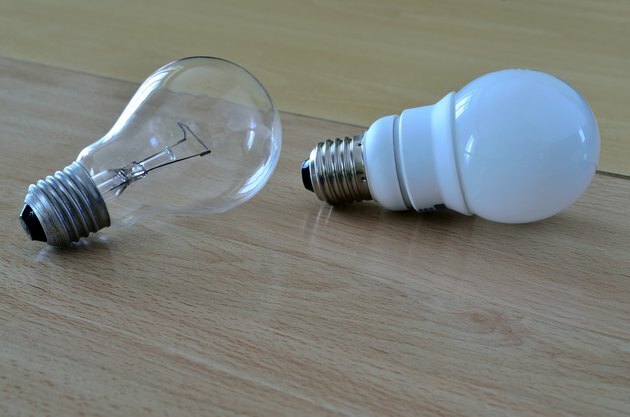 While both bulbs house and distribute the results of an electrical charge, an incandescent bulb's light is actually the result of the heat generated by an electrical current. This is the reason that an incandescent bulb that has been on for several hours is very hot to the touch. A fluorescent bulb's light is a result of the reflection from ionized gas that has had an electrical charge pass through it. When fluorescent bulbs were first introduced in the 1970s, the assumption was that they'd soon permanently replace incandescent bulbs. The fluorescent bulbs were more expensive to buy than incandescent ones, but they lasted significantly longer and required far less energy to power than the incandescent bulbs. In terms of energy and money conversation, it was a no brainer to use fluorescent bulbs. It seems as though the incandescent vs. fluorescent battle would be over before it began. However, there were negatives to take into account as well. There have been many concerns raised over the years about the degree of mercury present in fluorescent lightbulbs. Mercury is highly toxic to humans and animals, and although we don't know what mercury is like in terms of light exposure, those concerns have remained significant. Additionally, the quality of light that the fluorescent bulb projects is largely considered to be inferior. While incandescent bulbs project a warm, white light, the light of a fluorescent bulb is generally yellowish and unflattering. The reason for the difference in the quality of light projected by the illumination of an incandescent bulb vs. a fluorescent bulb has to do with light spectrums and light wavelength. Fluorescent light wavelengths are shorter than incandescent light wavelengths and deliver a different kind of light to the eye. Fluorescent light is on what is called an emissions spectrum. This means that its wavelengths are punctuated by lines. An incandescent bulb is on what's called a continuous spectrum. This means that all visible colors are present. In contrast to a fluorescent light spectrum, which only produces a limited amount of color, the incandescent light spectrum is more dynamic. The fluorescent light spectrum is called an "emission" spectrum because the source of the light is the output of electrified gas. In this sense, the light is emitted through something else. In the case of an incandescent light spectrum, the source of the light is the energy itself. What Light Sources Produce a Continuous Spectrum? As discussed above, an incandescent light bulb produces a continuous spectrum. However, incandescent bulbs aren't the only light source that produces a continuous spectrum. A very well-known source of a continuous spectrum is the sun. The solar spectrum is both continuous and incandescent. In that way, an incandescent lightbulb is the bulb closest to the experience of natural light. A candle is another example of an incandescent source that produces a continuous spectrum. If you light a candle and place it across the room, you'll be able to see the continuous spectrum of colors in the flame. The same is true of stars in the sky. While very few stars are bright enough for the colors of the continuous spectrum to be seen by the human eye, the incandescent spectrum is visible with a telescope when looking at an exceptionally bright star. What Light Sources Produce an Emissions Spectrum? Beyond the emissions spectrum produced by a fluorescent light bulb, other light sources produce emissions spectrums. An LED light is a good example of this. An LED light is illuminated when an electrical charge is run through a diode. Unlike a candle or an incandescent bulb, an LED light emits only one color. The pure light from an LED is generally blue in color, but it can be converted using phosphors the same way that fluorescent lights are. Another good example of light in an emissions spectrum is a computer screen. The light from a computer screen doesn't produce the full spectrum of color that an incandescent bulb or the sun produces. If you've ever seen an older computer start up, you've probably noticed the bands of color that appear. If you look closely at a computer screen, especially one more pixelated than a modern screen, you're very likely to see the bars of color. Only four colors exist within the computer spectrum, and these are expressed through the light. Is Fluorescent Light Brighter Than LED Light? When people think about light in terms of its brightness, they typically think about wattage. The assumption is that the wattage of the bulb indicates which light is the brightest. This is actually incorrect. The brightness of a particular kind of light is determined by a measure called lumens. The easiest way to describe lumens is to think of them as a measurement of the quantity of light. LED light and fluorescent light don't inherently have static degrees of brightness. Both kinds of light can be equally bright when projected by a bulb. The issue is the amount of energy it takes to get each bulb to achieve the same level of brightness. LED lights require much less energy than fluorescent lights do. This is what makes LED lights more energy efficient and longer-lasting than their fluorescent competitors. However, fluorescent lights tend to be more desirable in an interior space for everyday illumination than LED lights because fluorescent light tends to have broader coverage. Which Lightbulbs Are Best for the Environment? When discussing the varieties of light related to the environment, it can be difficult to know exactly which bulb is the best overall. Particularly in terms of fluorescent vs. incandescent bulbs, there are pros and cons on each side. Depending on your needs and budget, you may find that a combination of both bulbs is the best idea. Fluorescent lights require significantly less energy than incandescent lights. This is a boon for the environment, especially at a time where most cities are attempting to reduce their energy consumption. Fluorescent light bulbs, while more expensive, also last longer than an incandescent bulb. This means that although fluorescent lights are more expensive to purchase outright, the consumer winds up saving money in the long run because the bulbs don't need to be replaced nearly as often as incandescent light bulbs do. However, while incandescent bulbs require significantly more energy to illuminate, the bulbs themselves are less dangerous. Mercury is present in the gas that must be activated to illuminate a fluorescent lightbulb. This poses a problem when attempting to dispose of the lightbulbs. It can be dangerous to dispose of mercury, and this is not a problem presented by incandescent bulbs. However, the sheer number of incandescent bulbs that are required to do the work of one fluorescent bulb is also negative for pollution. Is Fluorescent Light Brighter Than Incandescent Light? It's natural to wonder whether fluorescent light is brighter than incandescent light. As mentioned earlier, the fluorescent light spectrum is more limited than the incandescent light spectrum. This doesn't have to do with brightness, but it does affect the quality of light from both bulbs. While both incandescent and fluorescent lights can produce equal amounts of lumens, it takes far more energy to get an incandescent bulb to produce the same degree of brightness as a fluorescent bulb. However, although fluorescent bulbs produce light with less energy, it does take the lights longer to turn on and achieve maximum brightness than it takes an incandescent bulb. Incandescent bulbs turn on and illuminate their filaments almost instantly. Fluorescent lights can take up to a full minute to achieve their full brightness. This may be critical if your needs are to illuminate a space quickly and reliably every time. There is also the matter of quality of light. Fluorescent lights produce a quality of light that limits the colors projected. This can create an unpleasant atmosphere in a space. On the other hand, incandescent light gives a continuous spectrum of light, most closely mimicking daylight or sunlight or the illumination of thousands of candles.